This traditional look recalls the Spanish and South Western influences found in Southern Florida, Arizona, New Mexico, California and Mexico. The appeal of this texture is it’s creativity and sense of uniqueness. Because it is done entirely by hand using a myriad of different tools and techniques, no two walls or ceilings are the same. Plus the option to create different textures in different rooms attracts attention. You can go virtually from a softer, subdued look in one room to a harder edged, funky feeling in another. This texture is primed and painted over and is the more expensive of the lot, due to the amount of material and hand labor needed. 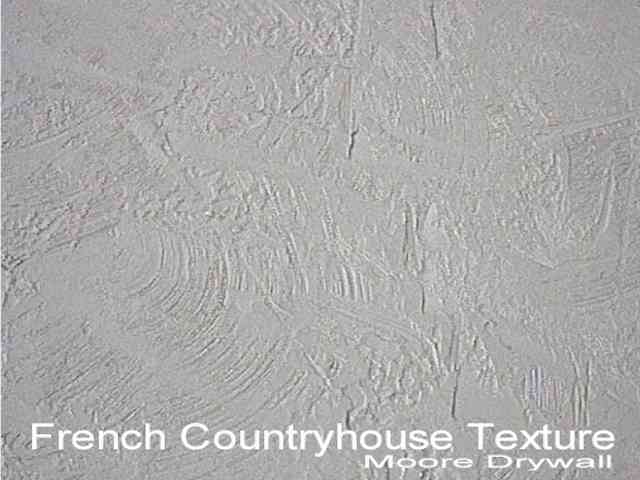 This texture works well on both walls and ceilings. It’s washability depends on the quality of paint used. Conceals practically all major flaws in older ceilings and walls.